Car is extremely nice, clean, and well put together. Nothing on the car is worn everything is good and tight but free floating. Direct drive spins nice and free, diff could use a cleaning and rebuild has been ran once since last rebuild. Comes fitted with a good True Speed 128 64 pitch gear. See spare parts in photos all in package parts are new. The one package is a inclined front suspension combo that only has the front a frames and Shock mounts in it. The inclined front blocks and axles were installed on the car. 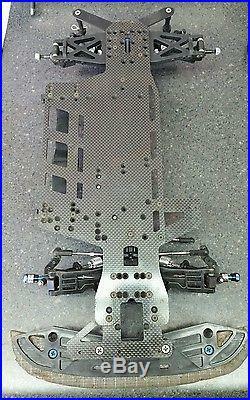 Also comes with a used rear body mount and front shock tower as pictured. Any questions please ask and see other items! 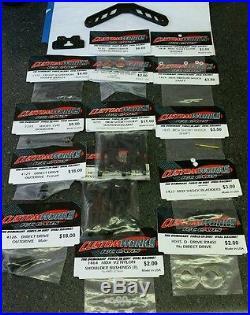 The item "Custom Works G6 Converted Late Model or EDM NICE With $100 worth of spare parts" is in sale since Sunday, February 28, 2016. This item is in the category "Toys & Hobbies\Radio Control & Control Line\Radio Control Vehicles\Cars, Trucks & Motorcycles". The seller is "bigheadturpin" and is located in Laurel, Delaware.